My 15-year-old texted me this morning from his high school class to break the news that “Prince, the singer, has died”. I had mixed emotions at first. My first thought, my 15 year old knows of Prince, I have succeeded at parenting! I was then crushed with the news of his death and had to fact check. The news was true, today we lost a legend. I was 15 the summer of 1984 when Purple Rain, the album and the film, were released. The summer of 1984. I was in-between my sophomore and junior years of high school, soon to turn 16. We listened to KROQ as if our lives depended on it. Prince and friends – Frankie Goes to Hollywood, General Public, U2, Bronski Beat, The Vandals, Billy Idol, Echo and the Bunnymen, Thompson Twins, Depeche Mode, Siouxsie and the Banshees, INXS, Wham, Duran Duran, The Smiths, David Bowie, Human League, The Psychedelic Furs topped the 1984 playlist. Let that sink in. Somebody go make me a mixtape. 1984 was a good year. In my cache of life experiences, Prince played a role. Unknowingly and not really, but almost, twice. In 1984, I got my hair cut at the Carlton Hair in the Westwood Marquis. If you knew me then, this is where I got the squares cut into the back of my new wave hairdo that caused all kinds of drama at school and at work, as a grocery bagger (we weren’t fancy enough to be called courtesy clerks like they are today, we were baggers) at Lucky Market. I spent a lot of time in Westwood in 1984-1985. Was it cool? I thought so and that’s why I got my haircut there. After a haircut, I took the elevator from the 3rd or 4th floor to the lobby. When the doors opened Prince and his giant entourage were there. Boom, like that. The bodyguards ushered me out and around Prince and his entourage and hustled me to the front desk as the group entered the elevators. I was stunned. What just happened. I just saw Prince for all of three seconds. We breathed the same air. Pause here for clarification – a phone book is a giant book of names and phone numbers. To find someone’s number and sometimes their address, you had to look up the name of the person or the business in the white pages of the phone book. Phone books were attached to every pay phone by a ridiculously short cable and you had to balance the phone book precariously while looking up the number you needed. A pay phone is a phone mounted to a wall or in a booth that charges you in advance of the call. You had to either rotary dial or push buttons to make the call. Local calls cost twenty cents. The operator – a real person until it became computerized – would tell you how much long distance calls would cost. We had no choice. No internet, no cell phones. This was our option. ARCHAIC. …looked up Paisley Park Studios in the phone book. PAISLEY PARK STUDIOS phone number (no address) was listed!! I raced back to the table to tell my friend and come up with a plan. The plan was to call and get the address claiming we had to make a delivery. That was it. That was the plan. I raced back to the pay phone, looked up the phone number again, deposited my twenty cents and made the call. “Oh, yeah, I need your address to make a delivery.” I stammered. “Uh…flowers!” Wow, I’m quick. We really should have worked out some details of this plan. Epic fail but a good laugh. How could you leave me standing? Allow me to repeat: The job of parenting is completely unrelated to the application process. Let that soak in for a minute. This hilarious come-to-motherhood fact strikes a chord with me not only because I am a mother of 4 absolutely perfect children, in my day job, I am a recruiter, a headhunter. As a recruiter, I talk about jobs, the application process, job descriptions and qualifications all day long. My children remind me daily that the job of motherhood is completely misrepresented by the application process. A mother’s reality check, a recruiter’s nightmare. Blatant misrepresentation. How is the case of this fraudulent misrepresentation not the lawsuit of the ages? Let’s all agree, making babies is fun. Fun is not part of most job descriptions nor a requirement for most jobs. There are fun parts of the mom job, but not all parts of the mom job are fun. This jokester card got me thinking, what if we applied for all jobs in our lives in the same “wink wink cuddle cuddle” fashion of becoming moms? For example, I want to be an artist, I want to be a CEO, I want to be an attorney, or, my favorite, I want to be a surgeon. What if we just clapped our hands and clicked our fingers and, as if by magic, in a very short 9 month window of time, the job you declare, any job from artist to surgeon to welder, is yours. Why not? After all, motherhood requires higher education which none of us receive, a lifetime of responsibility with no prerequisites, just a nine month waiting period before you can put your assumed innate maternal skills to work. Let’s take this train of thought to the next stop. Other than proclaiming, “I want to be a mom!” is there any mom job that I would want other than my own? Do you go around saying, I want to be that kids mom? I don’t. I already have enough chips off the old block, you can keep yours to yourself. There are some moms that do a far better job than I do and I truly admire them. And there are those times on occasion, I will admit, I have said quietly to myself, give me 10 minutes with that kid and this mom will straighten them right out. Fear not, I promise I have not said or thought this about any of your kids. I digress. Back to the question, is there any other mom job that I want? Mother Teresa? That’s a lot of giving goodness. I am not that good. Mother Goose? Being the imaginary author of fairy tales and nursery rhymes sounds like a good gig. My rhyming skills are weak, definitely don’t ask me to rap. Old Mother Hubbard? I’m not that old and I don’t want to live in shoe, though I do have plenty of children or so it seems some days. The mom job I most appreciate is the super hero of all mothers, Mother Nature. My kids often ask me what super power I would want to have. As they ramble off a list of super hero powers – flying, telekenisis, xray vision, morphing…, I interrupt and say, every time they ask, growing things. That’s not a super power, they say, and stomp off disgusted with my lameness. Growing things, call it gardening if you wish, is my super power, following Mother Nature’s lead. Plant a seed, give it what it needs – warmth, love, attention, food, shelter – and POW! In true super hero fashion, that seed will grow. Isn’t that motherhood at its finest? Do we offer anything more as moms? We all learn how to be moms through observing our own mothers, our grandmothers, aunts, moms of friends and, of course, TV moms. The mom we mimic most though is often unrealized and underappreciated. Mother Nature guides us by example. Love and warmth from the sun’s rays, occupying our minds, bodies and spirit with mesmerizing natural beauty. Mother Nature provides food to hunt, fish, gather and grow to feed us and naturally formed shelter to protect us. As much as Mother Nature gives, she also shares traits of most moms I know. If we children do as we’re told and play nice we are rewarded, the sun shines, the plants grow, all is good in the world. Well behaved children means happy mom. If we misbehave, Mother Nature display the ultimate wrath throw down. Her head spins just like mine, only she unleashes hurricanes, tornadoes, ice storms and blizzards. I just lose my mind. Similar wrath in her house and mine, just ask my kids. Though growing things is my desired super power, I do not meet all of the qualifications required for the Mother Nature job so I won’t apply should the position ever become available. Meeting the qualifications for a job has never stopped me before. I’m not certain I was qualified when [ahem] “applying” each time I became a mom. I often say I have the best job as a recruiter. Truth is, the sweetest job is to be my kids mom. Truth be told I don’t have a black horse. I should. At least a miniature pony. Or even a goat. With a cart. I live in the city and no goats or horses or ponies with carts are permitted. I could manage a few chickens but I’ve drawn the DIY line at chickens. I can get fresh eggs at the farmers market easily enough. We did have a black dog [RIP sweet old boy Dale Anthony]. 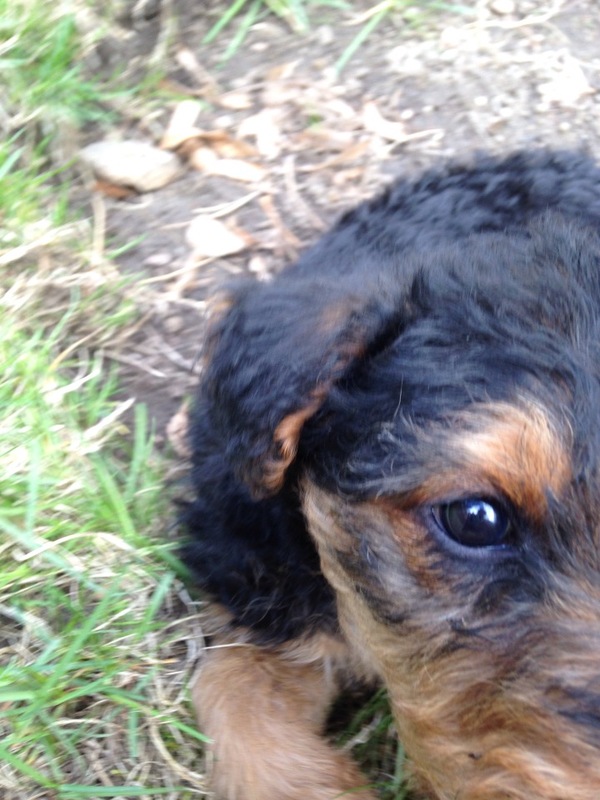 Now we have a black-brown dog. 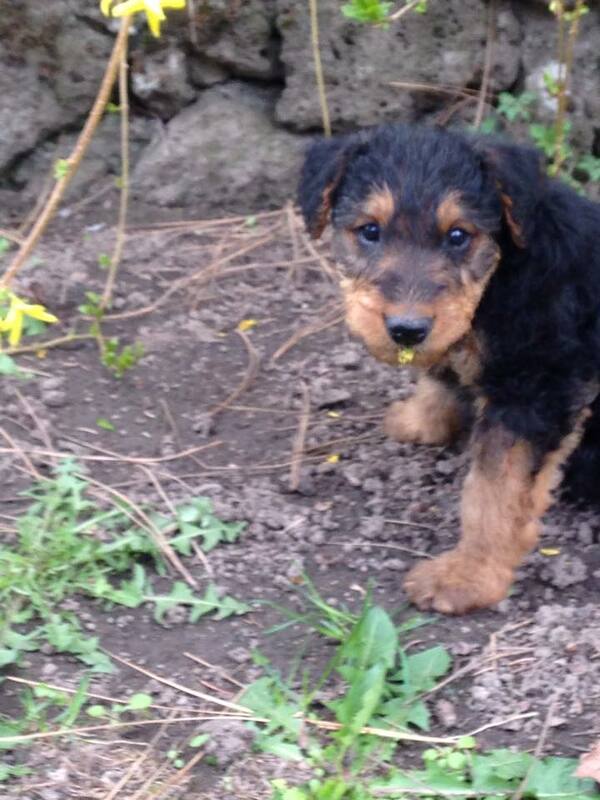 My horse in this story is our 8 week old Airedale Terrorist puppy, HRH Prince Ezie Otis. Ezie, to us common peasants. In this photo, Ezie is sitting in the well of our cherry tree, ready to play. He doesn’t realize [total apprentice fail] that we’re on a gardening mission. We have work to do. Sabotage is on his agenda, not work. Mother’s Day 2014, my four kids [notice they are nowhere to be found when I get in gardening mode] each bought me a fruit tree for our front yard orchard. One side of our front yard is a vegetable garden, the other side of our front yard is our fruit orchard. 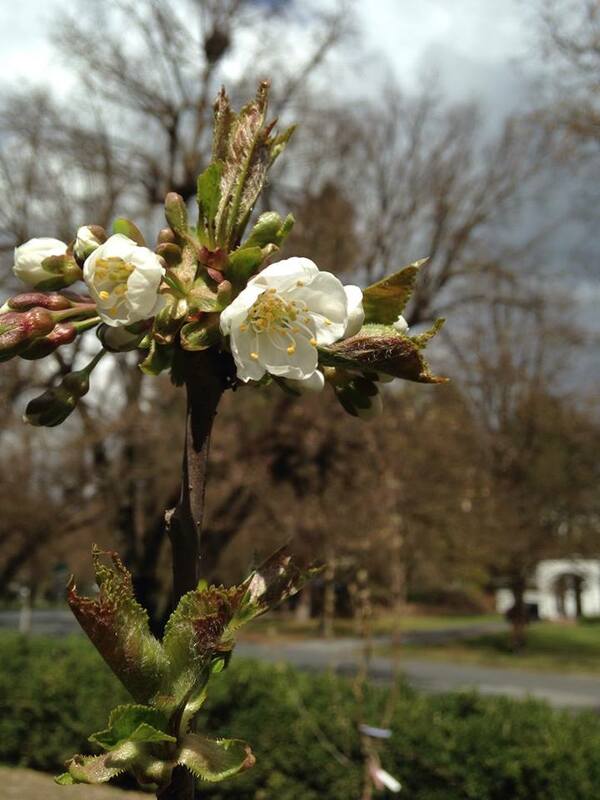 In our orchard we have three dwarf trees – cherry, apple, and pear and 1 dwarf peach. With the exception of the peach tree, the cherry, apple and pear are grafted trees. The purpose of a grafted tree is for cross-pollination within a small space. Instead of needing multiple trees to meet the pollination needs required by some fruit trees, 3-5 trees are grafted together to serve this need. And I get a variety of fruit from planting one tree. Sweet! Not a lot of gardening progress on Day 2, but happiness is found with a big [growing] black-brown dog under a cherry tree. 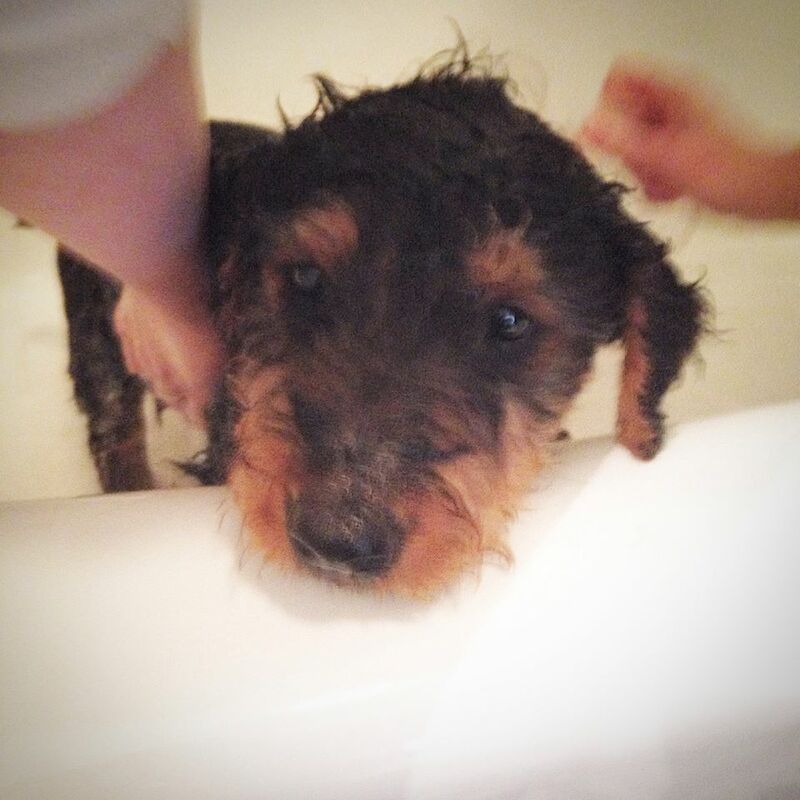 Thanks to the rain and mud, HRH had to have his second bath this week. What Is the 100-Day Project? It’s a celebration of process that encourages everyone to participate in 100 days of making. The great surrender is the process; showing up day after day is the goal. For the 100-Day Project, it’s not about fetishizing finished products—it’s about the process. The project began on April 6 but, if you’re like me and forgot to start until April 8, you may begin at any time and finish at your own pace. Whew. I’m in. My project focus is gardening, #100daysofgardening, and my creative process will be posted daily. Pause here for clarification: yes, I know I’ve written many times that I will blog/exercise/eat right/do something daily and then drop the ball. Guess what? I may do fail to meet the daily expectation. Life happens. However, with heightened awareness, a sense of purpose, and our last threat of frost rapidly approaching, I am going to try my damnedest to garden daily. Really, I have no choice if I want a garden this year. Yesterday, I ventured to my front yard garden to assess what prep work will need to be accomplished. Front yard gardening is a big deal, Google it. It is controversial in some areas, forbidden (the horror!) in others (doubt me, ask your HOA or check with city/county regulations) and subject to extreme criticism from the neighborhood. My front yard garden is permissible (no HOA strings on me), no city restrictions (I checked), and has been well received by the neighborhood. I made new friends last year during the construction phase of the garden too. Last year, I dug up all the sod (yes I could have rented some machine to do the job but I needed the therapy of physical labor) and created 10 unformed raised beds and pathways in a keyhole design. Unformed raised beds are just like raised beds without the wood frames. 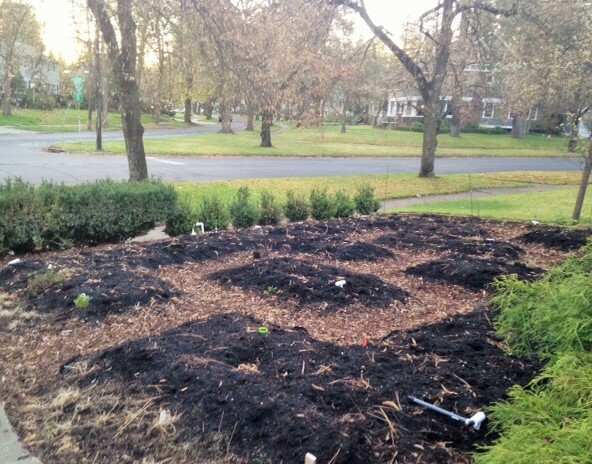 Unformed raised beds may require reshaping each new gardening season. I reshape while cleaning up winter debris or adding soil amendments, not an issue for me. One district representative did ask me, “What would [will] happen to the dirt when it falls out of shape?”. [dart your eyes back and forth a few times and raise your eyebrows like I did in the moment for effect.] “The dirt will fall to the ground”, I replied. Total state of chaos. Save yourselves while you still can. My first asparagus. I am surprised because I bought three asparagus starts at the Manito Park Plant Sale last summer and just stuck them in the ground, not paying heed to the planting direction of digging a special asparagus trench (what?) and other special asparagus tricks. 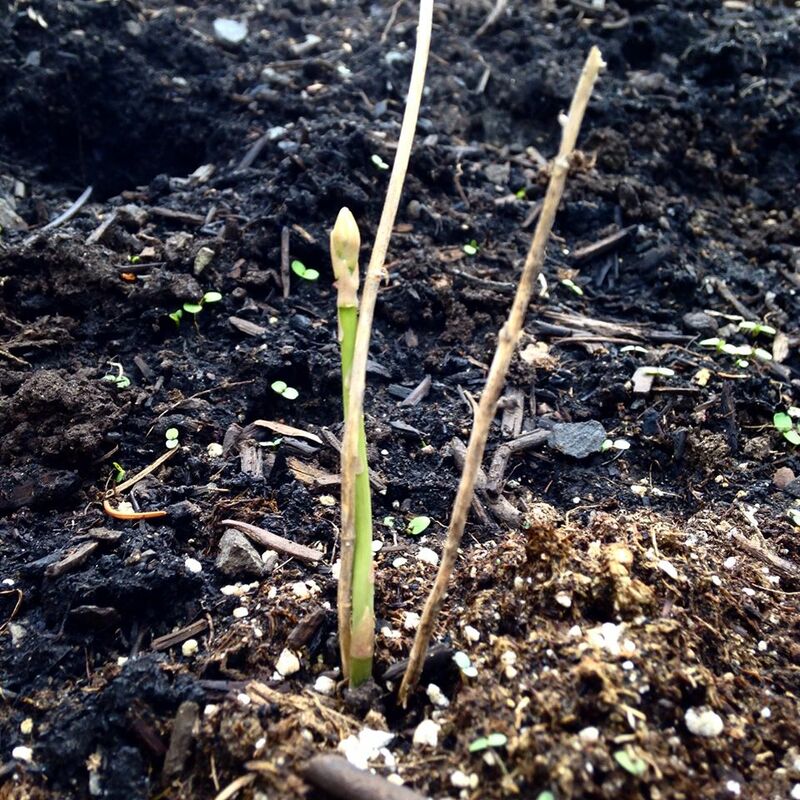 Asparagus starts are supposed to take two years to produce. I planted just to see what would happen. Lo and behold, an asparagus is born. 100 Days of Gardening is not going to be easy, it will be a lot of work. The process of this work is what I love. The produce is what I enjoy. Technically, it is not yet spring. We’re in flux between cold winter nights and spring temperature days reaching the high 40’s low 50’s with no snow on the ground. Perfect weather to clean up after winters’ storms, raking leaves and pine needles and scooping up the mess left behind from Mountain Ash berries dropped and rotting on the ground. Branches and twigs add to the fun of spring clean up. Spring clean up is triggered by Yard Waste Pick Up by the city trash collection that starts this week after being on hiatus since November. No one in my house is as excited as I am to clean up the yard and garden. The troops would not rally. Chief Does-No-Yard-Work led the campaign against my pleas and effort with a ‘why bother’ attitude the rest of the tribe accepted as gospel. Fine. I grabbed my rake and yard bags and stomped out to the front parkway to rake leaves. Didn’t I just rake leaves in the fall? Why are there more leaves? The first snow hit before all the leaves fell from the trees, so the leaves just fell at whim creating work for me this spring. I’m excited to clean up, excited for spring, excited to plant my garden. Lots of time between now and May when our last frost date is scheduled. Between now and then, a lot of planning, outside projects and prep will take place. Until then, clean up. Raking and bagging, raking and bagging. Since we’re on a pie shaped lot with the front parkway the largest expanse of the slice of pie, there is a lot of work to be done. Neighbors and passersby kept me entertained and distracted. Drivers that ran the stop sign received a yelp and a wave of my rake. I gladly stopped and chatted, catching up with neighbors I hadn’t seen all winter. Two people though, really made me question humanity. A guy walking his dog, stopped to let his dog crap in my yard and continued walking. I was standing maybe twenty feet away. “Excuse me,” I shouted after him, “do you mind cleaning up after your dog?” He said, “Sorry, I don’t have a bag”. I ran up to the house to get him a bag, but he was kind enough to high tail it out of there, leaving the dog doo where it dropped, before I returned. Charming. I was ready to chuck my rake at someone, but continued about my business, grumbling to myself. Then, just as I was finishing my work, a tan Mercedes rolled up to the curb. An elderly man got out of the car and approached asking if the original family still owned our home. I explained that we purchased the home almost two years ago and the original family downsized but lives nearby. He explained his mother in law lived four doors down yet he always loved our home. He asked if I was aware of the 1946 issue of American Home featuring our home, which we discussed at length before he continued on his way. Today’s encounters reminded me that every day, with every action, to make the right choice, to do the right thing. Walking your dog and going for a run are awesome and I applaud their efforts. I hope tomorrow provides each with the opportunity to focus beyond themselves. And, truth be told, I hope karma catches up with them. I’m thankful for the gentleman who stopped and took the time to share his story and history and, in doing so, restored my faith in humanity. The leaves are raked and ready to be hauled away. Spring is on its way! Guilty. I am guilty of poor word choices. Newsflash, we all choose our words poorly at some point. I find myself caught in this trap more often than not, mainly because it is easier to drop a curse word than to think about some G-rated interjection. Words are powerful, they reflect who you are, your opinions and your intentions. My children are taught to choose their words wisely, if not, I’m on their case. When I fail to choose wisely, they gang up against me like a pack of wild hyenas in attack formation. I am outnumbered. I know it. They know it. They watch me, circling, laughing, ready to pounce at my slightest error. To their great pleasure, I make poor word choices. We all have our moments. My thirteen year old has picked up a habit this school year that in true teenager-parent fashion, drives me mad. His response to near everything from eating pizza, to checking the fit of clothing or shoes, to watching something on TV is “it’s not bad”. “It’s not bad” are three words that have caught me off guard as a hidden buzzer that delivers an electric shock to my brain. AGH! It’s not bad. What does that mean? Is it good or is it bad? Not bad, in a double negative sense, means good. He claims he did not say it was good. Then what dear child are you saying? Formulate an opinion! This is where my Wonder Mom powers are activated (much to his chagrin) and the lesson begins on negative statements and double negatives take over. The lesson is simple, any time you use a negative word in as sentence, your statement, is negative. Period. Think about it. Think about your statements. Yikes. Negative words are no, not, nothing, none, nowhere, neither, no one, nobody, scarcely, barely, hardly. Two negatives Not + Bad, in a double negative, which result in a positive. Though double negatives were popular with Shakespeare, double negatives are poor grammar. Period. Not up for discussion. Double negatives are bad, negative statement intended. Poor grammar in my house? Negativity out of my teenager’s mouth? What are they teaching at school? The heinous error of negative statements happens everywhere, daily. I receive work emails that state: “Please don’t hesitate to call”. Consider writing “Please call”. I just attended a school Veteran’s Day assembly where a child quoted “I can’t say thank you enough”. How about “Thank you so much”? My hair salon “just put you down” for an appointment. Try “You are scheduled…”. Word choices. We all speak negatively. It is as easy to speak negatively as easy as it is to drop an F-bomb. It is easy to speak positively, we all need to develop the habit (with some of us more years of unravelling old habits than others). Let’s all try to choose our words wisely and positively to send the right message to each other. My husband chimes in at this point. “Your mother is not incorrect, though I’ll never admit she is right”. Choose your words well and do what you say. Today a Facebook friend posted that her new least favorite word is listicle. Do you know this word? I did not until I Googled it and learned that (I quote and or paraphrase Wikipedia) listicle, in journalism and blogging, is a short-form of writing that uses list as its thematic structure, but is fleshed with sufficient copy to be published as an article. A typical listicle will prominently feature a cardinal number in its title, such as “10 Ways to Warm Up Your Bedroom in Winter,” “The 5 Most Badass Presidents of All-Time,” or “25 Hairstyles of the Last Hundred Years,” with subsequent subheadings within the text itself reflecting this schema. The word listicle is a portmanteau derived from list and article. Ack! Another word I don’t know! What is a Portmanteau? This one Facebook post took me on an unplanned research journey today. A portmanteau are two words and sounds morphed into one word, for example, smoke + fog = smog; motor + hotel = motel. Electric Company didn’t teach me portmanteaux and Schoolhouse Rock only ventured as far as compound words. Praise be for Wikipedia, social media and the internet! We all know these articles called listicles, the internet and magazines are filled with them but did you know they had a name? Did you know they were listicles? I’m not sure why my friend finds this word as her new least favorite. The word doesn’t offend me as I often get suckered into reading listicles by their title alone and, ultimately, enjoy reading listicles. Though I don’t mind the word listicle, yet, for reading material, listicles lack depth and fail to deliver more than their title implies. As a blogger, I should be more listicle saavy, alas I am not. On Monday this week, I received a work email inquiring about potential opportunities at the company. Nothing unusual, as a recruiter, this email is typical fodder for my day. What was unusual was the email was written and sent from Kathmandu, Nepal, at base camp, while the author prepared to climb Mount Everest. This was an exciting an motivating start to my week, how exciting! Tonight, as I sit here and contemplate listicles, I wonder what the hell am I doing with my life? Here I am, blogging nonsensically about randomness and I have to question why. Knowing my friend, I may have touched on why she doesn’t care for the word listicle. Maybe The Secret Life of Walter Mitty that’s playing in the background is seeping into my pores and challenging me to bust out of my comfort zone. Perhaps I need to write a listicle on “10 Ways To Be More Adventurous”, “Top 5 Heart Desires”, “Journal Instead of Blogging – 3 Reasons Why”, or “Find Out 20 Things You Should Be Doing To Capture the Quintessence of Life” (ok, that has strong Walter Mitty influence). I could listicle on listicles. I could wax poetic or bust a rhyme on listicle, but the only words I can think of that rhyme with listicle is article (duh), popsicle, bicycle (uni and tri varieties as well), icicle and testicle. At least, these are the first words that entered my brain, let’s not analyze what that means. I’ve written listicle eighteen times and the word is beginning to grow on me yet, as a writing style, needs an adventure as muse.